Finished Sep 2017. Final score: 4 / 5. It was recommended by NPR and by a handful of people on the 'net. I've read and enjoyed Stephen King before. Also, a TV series is now out. This is now my favorite Stephen King book. I have not read that many Stephen King books. The only additional one on this site that is not reviewed is The Regulators by "Richard Bachman". I thought it was decent. I liked the book It well enough. After a few hours, I gave up reading The Stand. It was getting too complicated. Anyway, this book, I read it all the way through no problems. It was quite enjoyable. I've been told that Stephen King likes to have characters from his previous novels. I have been told fans like that. I do not. Characters from It do make an appearance in this one. I would've preferred they stayed away. The side story itself was decent enough without what I thought was a lazy addition. I'm giving this a pass because the trip to Derry was a nice detour. The book would've been lacking with out it. By the books title, the goal of the book centers around the JFK assassination. I won't mention wether or not President Kennedy is saved. However, I will say that the big hero exit felt absolutely forced. It felt both highly convenient in moving the story along and made no damn sense to me for the character's motivation. Something I enjoy a lot is a special Epilogue where the author discusses the story itself. If you ever get a chance to listen to the audiobook version of Ender's Shadow, Orson Scott Card goes in to detail about the frustrations of making an Ender's Game movie. It was fascinating. What makes OSC's Epilogue so fascinating is the Ender's Game movie that ultimately arrived was absolutely terrible, and the movie did everything that OSC did not want to happen based on his Epilogue that predates the movie. For Stephen King's Epilogue on 11-22-63, he goes in to the mountains of research he did to most accurately recreate the scene and events leading up to the assassination. I appreciate the recreation. I felt like I was there. The events felt real. If you are a fan of Stephen King, read this book. It is a nice trip. If you are unsure about reading Stephen King, this book is a nice intro to his style of writing. It is easy to read. It is not horror. It is just a nice sci-fi quirk that makes an interesting story. 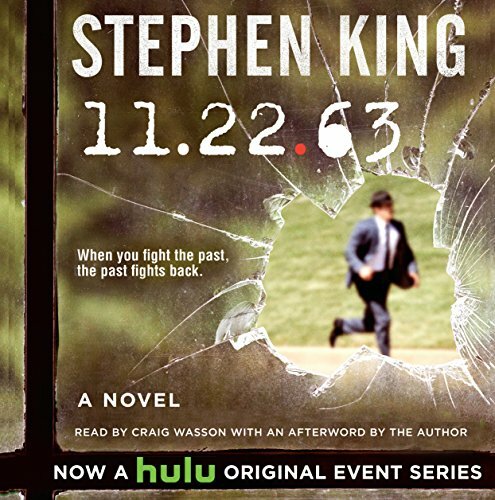 Discuss 11-22-63: A Novel in the forums.